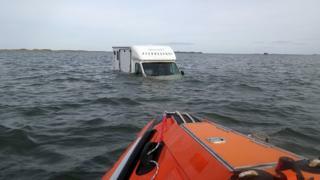 A horsebox driver became stranded when he attempted to cross a causeway at high tide. The man had to be rescued when the van became submerged on the Holy Island road, which is under water twice a day. He added that despite the language difficulty they were able to establish no animals were inside the horsebox at the time. The rescue happened just after 15:00 GMT on Saturday. Safe crossing times to the island - also known as Lindisfarne - on Saturday were 08:20 until 13:50 and it was unsafe to cross until 20:50. Northumberland County Council installed warning signs at either end of the mile-long causeway in 2012 in a bid to cut the number of strandings. They display a message to check the tide tables followed by the safe crossing times.